To build and maintain applications required to reach out to you customer through Mobile & Smart phone is expensive. Management perception compounds the problem. Anybody, not intimately familiar with this technical challenge, perceives that the effort of developing a mobile application should be proportional to the size of the screen. In other words, since mobile screen is much smaller than a PC or a Laptop screen, the effort required for developing application should also be proportionately less. Hence the budget for developing and maintain mobile channel becomes small! Only way out is to use a tool or a framework which can support multiple platforms. However, as of today, there isn’t any “one size fit all” tool. There are many tools available in the market – each has its own strength and weakness. So, how do you go about selected the tool which is right for you? Do you really need an installable native application? Why not just stick to a mobile website? If an installable native application is really needed – which platforms should you target now? One year down the line? What is the expected life of the application? Will you be ready to scrap it in a couple of years’ time? If you make a native iPhone application which does not feels like a true iPhone application – would it be acceptable? What about similar Android application? If so then you need only to look at the first of the five categories of the tool given below. There are some important frameworks are missing in this article such as dojo/dojo mobile. Thanks for your article. 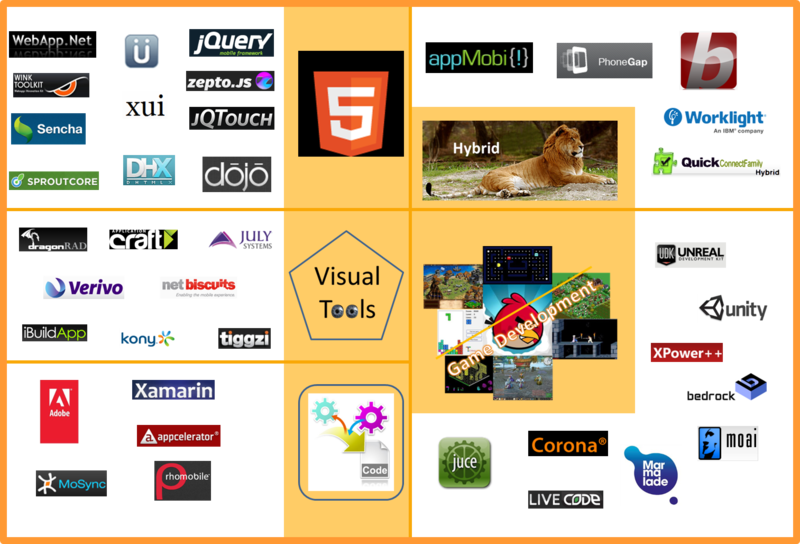 I’ve posted an article focusing on the “app generator” style toolkits here for your reference. There is another tool, XPower++ from Technologies++ (http://gridplusplus.com/). It is soon a must for all companies that develops Apps for more than one platform to implement a framework or a tool. It is just to expensive, slow and insecure to go native on all platforms with one team and one source code for every OS and device type. Sencha, MoSync, PhoneGap etc now follow standards from W3C and others so I believe that its easier to make a move now than earlier. Hi Udayan, Thanks for the post. Posts like yours are bubbling up more now than 6 months ago, showing that the market is reaching a certain level of maturity. Thanks for pointing it out – I will cover it under Visual tools. What about Microsoft’s XNA and XAML based WPF and Silverlight? That clearly qualifies as WORA. And to substantial extent all the needed tools and IDE are free. And not to forget, .net port Mono.